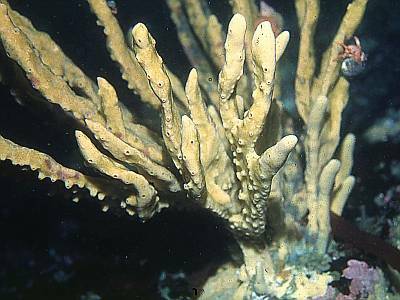 Description: Isodictya palmata (Ellis and Solander, 1786) is a large palmate deep-water sponge, occurring in the boreal and sub-arctic North Atlantic. Smaller specimens may resemble Haliclona oculata or H . simulans, but from these it may be readily distinguished by the arrangement of the oscules in groups along the edges of the flattened branches. Erect, digitate, up to 35 cm high, with variably compressed branches of ca. 2.5 cm wide, which may coalesce into plate-shaped areas. Distribution: A northern species, recorded from the North Sea coasts of Scotland and England. Similar Species: This species looks like a larger and more robust version of Haliclona oculata but is immediately distinguishable by the position of the oscules. Oscules with slightly raised rims on flattened side of branches. Picton, B.E. & Morrow, C.C. (2016). Isodictya palmata (Ellis & Solander, 1786). [In] Encyclopedia of Marine Life of Britain and Ireland.